"It is a tranquil place surrounded by trees with swathes of bluebells running between them"
It’s simple to arrange our service. You can contact us before the final day or after your pet has passed away. We offer a same day service as well as an attended one that gives extra peace of mind for our visitors. Whether you're looking for the perfect urn or casket for your home or as part of the cremation service offered in-house, Dignity has a full range on offer. We are celebrating 25 years of our individual pet cremation service helping animal lovers give their family pets the respectful send-off they deserve. What our Customers our saying about us. You really looked after us, especially my mum. You made such a sad thing so much easier for her, I really thank you for that. Dignity were helpful, polite, respectful and more than anything treated my mate with the respect she deserved. Nothing I say or do will be enough thanks. On every occasion the staff have been nothing but compassionate, supportive and professional. They truly are irreplaceable and make, what is a hard time for a lot of pet owners, that little bit easier. A lovely, peaceful, warm place. Just how somewhere for pets should be. Thank you to everyone who works there. From the first telephone call through to collecting her ashes we were treated with sensitivity and respect in our loss. …It eased our pain to know that he was treated with such gentleness and care. You have been professional, gentle and terribly kind during what is always a very hard time for any pet owner. Thank you. We were very touched by the lovely card you sent with her ashes. Your handling of her cremation and your efficient service was excellent! The surroundings, atmosphere and above all the whole service was geared towards making life easier for us. …It was a relief to find people who still take the time to care. Dignity Pet Crematorium is a multi-award winning small, independent, family owned pet cremation service established by Barry & Carole Spurgeon in 1992 and now run by Kevin Spurgeon and a dedicated team of pet lovers. Over the years we have built up a reputation as one of the best pet crematoriums in the country through our honest, caring and personal attention to each pet and owner who needs our service. We operate to the highest standards and guarantee your pet will receive a genuine and respectful send-off. We have chosen to ONLY carry out genuine individual pet cremations, and promise your pet will be handled with respect, care and dignity at all times and be cremated ON ITS OWN. Dignity Pet Crematorium DOES NOT carry out mass pet cremations or incinerate clinical waste. At Dignity we are proud of the service we offer and want you to have all the information you need in order to make an informed decision. We have been independently inspected and approved by the APPCC and are Trading Standards Approved. You can read a simple guide to using our service here or a step by step Guide to our Working Procedures here. 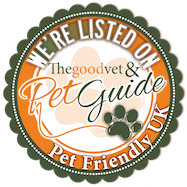 Please read the live customer reviews about us which prove how our service will leave you in no doubt that your pet will be looked after on their own and will give you peace of mind that they will be treated with the dignity and respect that they deserve. To find out more about arranging your pet’s cremation simply telephone us on 01252 844572 and talk us through your wishes.